Jobs in print media may be drying up, but content marketing has created thousands of jobs for writers. On this new playing field, what exactly does it take to set yourself apart from the army of other content marketers? …and a whole lot of caffeine. 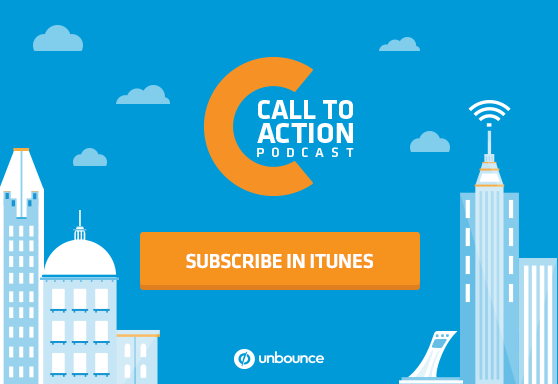 In this episode of the Call to Action podcast, Demian breaks down the anatomy of a successful web writer. Why any compelling piece of content needs to begin with thorough research. The difference (and similarities) between web writers, content marketers and copywriters. Why having a working knowledge of SEO is no longer optional. The Perfect Anatomy of a Modern Web Writer [Infographic] by Demian Farnworth via Copyblogger. In this episode: Dan Levy, Unbounce’s Content Strategist, interviews Demian Farnworth of Copyblogger. Stephanie Saretsky: Jobs in print may be drying up, but the demand for writers on the web is booming due to the success of the content marketing industry. But what does it take to truly make a splash in the web writing world? Determination. SEO knowledge… and a whole lot of caffeine. Unbounce’s Dan Levy spoke with Copyblogger’s Demian Farnworth about his concept of the web writer’s anatomy – the parts that make up a successful web writer and how to pick a well rounded writer out of the crowd when hiring. Plus, they discuss how to tackle that dear old friend, writer’s block. Dan Levy: All right. Well, before we get into the anatomy of a modern web writer, we should probably address what exactly you mean by web writer. 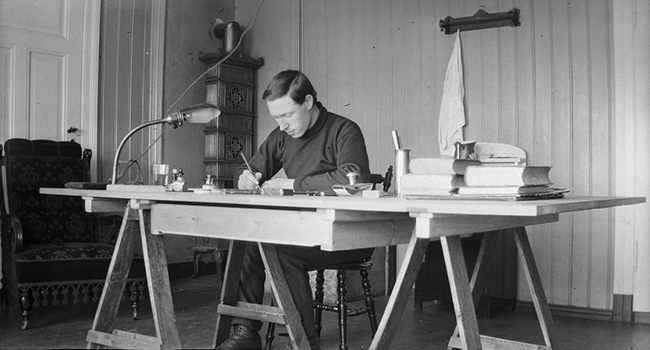 We know what copywriting is and there’s lots of talk about content marketers. But are you thinking about something specific when you talk about a web writer? Demian Farnworth: I think everyone who writes on the web is a web writer. And so I make the distinction because I grew up in my career online and actually about six or seven years in, I went and did print for a while. I did both, but I went and did print, and I noticed that the people who were bred in the school of print did things differently. It seemed like a lot of what we were doing online was bleeding into what was being done in print. So, yeah, really the distinction I’m making is a person who is focused on writing for the web. Dan Levy: That’s interesting. So you actually started online and then went into print – that’s unusual. Demian Farnworth: Yes. And I make that distinction because like someone who writes in print strictly, which I think is a dying breed, but wouldn’t need to know a lot about SEO or maybe something about usability but that’s in some sense kind of out of their control because of the constrictions on real estate in the print world. But SEO, they would never use that. Dan Levy: Fair enough, yeah. How did you find that the online world was bleeding into the print world? Demian Farnworth: Well, in the sense of brevity and headlines we lean towards more sensational provocative headlines online vs. print even though I think that’s been through the print world. It’s always been in there but I think as people saw how it worked and influenced the way people read online that people in the print world began to take notice and say things like that need to change. It’s in the way we write and how we write and mainly being brevity. Demian Farnworth: Yeah, I actually worked for a traditional publishing company for a little bit, and I found that – it was a magazine company – and there’s a big tradition in magazines of having kind of like colorful and like maybe undriven titles and stuff. Demian Farnworth: And in this case I actually found thinking about things like SEO and being super clear and leading with the benefits – I’m using keywords even if they didn’t think of them as keywords that people were searching for – just that mentality was trickling its way into print as well so. Dan Levy: That’s a great point yeah, right, instead of benefit laden and what’s the actual article about and the lead-in paragraph being well written. Demian Farnworth: Totally. Well, I mean, that’s the first characteristic that you see a modern web writer should have is an average understanding of SEO. Dan Levy: I was wondering why only average do you think, when search engines are so fundamental to how content gets discovered these days? Demian Farnworth: Yeah, that’s a great question. So two things really. So when I say average understanding, I mean you need to know like how search engines work, and you need to know how people use them, they go on, they’re searching, and then like what is it exactly Google does to deliver those actual pages and not these other pages. So having an understanding of page rank and just the keywords that are used and how those are used in ranking pages and links. When you’re thinking through I always try to start with the customer. Start with the reader, you know, the end user, like how are they coming to what you’re writing for so you have to know that. But I only say average because really like we live in a world now where CMS, content management systems, do most of the SEO work for us, behind the scenes, where you can just drop in the title tags. But a lot of the code is already enhanced for you, it’s clean already for you, and really what you have to worry about as a writer is just “am I using the right keywords?” because really ultimately it only comes down to writing for people, and that’s what Google’s been telling us all along. When you write for humans, you’re actually doing us a favor. We’re gonna love that kind of content, and that really kind of came home to me when Google released Panda, and in that sort of mix of things they were turning out these blog posts. One of my favorite blog posts that they shared was this one where they it says “here’s what you needed to worry about with Panda. Think like a Google engineer and here are some of the questions.” There were 21 questions that they asked, and I was like that’s the framework… that’s all you really need to know about SEO. Are you sort of solving these things? Are you answering their questions or are you giving original in-depth research? Are you presenting a trustworthy persona with what you’re doing? Is this well edited and it’s not sloppy and it’s proofing. It’s a lot of these basic things, and that’s always what I thought about. SEO is complicated, and yet when it comes to huge sites there is a lot of backend work and you need people who are – that’s their profession to take care of that stuff. But I think from a writer all you really need to know is that sort of fundamental of what Google is looking for. Dan Levy: Yeah, you don’t have to know how the sausage is made, you just have to know the intent I guess behind making that sausage or who that sausage is for… if I’m gonna belabor the metaphor. Demian Farnworth: You also see that web writers need to have an average understanding of usability when you talk about things like white space. Dan Levy: We talked about the importance of a white space before with regards to stuff like landing pages, but why do you think this design principle is something writers should think about as well? Demian Farnworth: I think because when you are publishing something online you’re presenting it in a way because it’s always about getting people to read what you wrote. So you want to draw people, invite people in, so when they see a lock of text for instance, and I’m like okay that’s just not very inviting. And I always talk about do you want people to kind scrabble down the page. So using a latter metaphor instead of you using short paragraphs, short sentences, that sort of thing, there’s more white space there than there is actually text. I think that just the looks are sort of aesthetic beautiful at the same time too because it’s just simple and it’s elegant, especially and particularly if you’re fighting and you run a large site. And there are ads all around you; you have to compete with that, so I think about usability. When I write stuff I write it on my own blog, and I will hit preview. I’m always hitting preview to see “okay how did that certain turn out?” even though this is gonna go on a different website. I’m always looking like “so how is that going to look on the page?” because I think at the same time and maybe this is just me, but to me writing is an art and not just the craft of writing yourself but the way it appears on the page, and is it appearing inviting? Is there for every three sentence long paragraph, how many one-word paragraphs do you have that just allows that, so people can just kind of tumble down the page. Dan Levy: Yeah, I mean there’s definitely a rhythm to it that’s like an auditory thing but it’s also a visual thing. Demian Farnworth: Yeah, two books or just like sort of fundamentals is the usability thing for me and one of them was Ginny Reddish’s Cutting the Words. Jacob Nielson was saying this back then too was that whatever you write for the web what you think should go on there if it’s in the print word, cut it in half, and so it’s like that thought of “okay well so I need to say things a lot more.” In some ways the web gives us real estate and it seems to be kind of infinite in a sense. If so, we’re not really forced to write in compression, but I think if you want to write well online you need to write within compression. So giving yourself – in fact, okay I can say this in a thousand words. What could I say in 100 words, and that’s in my mind usability. Dan Levy: Let’s talk a little bit about copywriting. That’s a topic that I know that you are known for in particular. You say that web writers need to have an outstanding grasp of not just an average grasp but an outstanding grasp of. You write in your post that copywriting begins with empathy for your customer. Dan Levy: What do you mean by that? Demian Farnworth: They’re the end users and that’s who you’re writing for, so when you’re writing you have to understand what is it they really want because we all have great ideas. But is it actually something meaningful or useful or entertaining or educational for that person on the other end. So like looking at your audience. Understand what do they want, and copywriting for me, that’s the lesson that I’ve always learned from my mentors and from the books that I’ve read is just like know your audience, know your consumer inside out. Because then you could use their language. You can use authentic language that resonates with them. The other thing about copywriting too that’s so important and it’s a sense of writing to persuade from your headlines to the first sentence and to the end. Because we talk about copywriting is the difference between that and just sort of your average writing. You’re looking for a reaction. You’re looking to get people to perform some sort of action, and so having that thought of not only do I need to get attention, but I also need to create a desire throughout that. So what is it that makes my consumer tick, so that’s the empathy part, and then finally how can I then write in such a way to get them to perform this particular action. I think that mindset changes. Copywriting helps change that mindset of I’m just getting out there and saying something to getting out there and saying something very persuasive. Dan Levy: Yeah. It also actually now that I think of it, it relates back to what we were talking about with search, which is putting ourselves into the mind of the person who might be looking for this content. Dan Levy: In the search world I think they call it user intent but what we’re talking about is empathy. Demian Farnworth: Yeah. Yeah, absolutely. Dan Levy: Well, the next web writing organ that you zero in on if we’re gonna go with the anatomy analogy is storytelling, and storytelling has become something of a buzz word in the last few years. But what does being a great storyteller really mean from your perspective? Demian Farnworth: That’s a good question. So, yeah as you said it’s really kind of the hot topic lately, but it’s always been with us, and we are born to tell and to hear and to want to hear stories. And I think the thing about stories, and again, this goes back to user intent and thinking about the customer. But what’s the most entertaining way that you can “preach” at them but not make somebody feel like you’re preaching at them. So that’s the lesson for storytelling because it’s that essence of being able to open up even if you’re going to teach somebody something as sort of kind of technical like SEO or usability. I think opening up with a good story maybe even trying to weave that metaphor through it helps people not only get them onboard, but could help them stay onboard, I think too people like, whether it’s a personal story or just a made up story, people just generally enjoy hearing stories, and that’s just what really kind of good journalism is really all about. I think we have a lot to learn as copywriters and sort of marketers and stuff like that is like what we can learn from journalists, the stories they tell, and everything doesn’t have to be sort of bare bones educational pieces of content. But it can actually be a story because I also think too like the stories that you tell help because we do also live in this world where it’s like marketery writers, it’s like companies are allowing writers to be their own brand, and that’s why they hire them because they bring them on. And so in the story you tell you have to sort of help carve that image of who you are because we’re always online and we’re always kind of sculpting our image in a certain way through the stories that we tell. It just helps communicate particularly complicated issues a lot better. Dan Levy: Yeah, I guess that’s sort of where copywriting becomes content marketing is when you bring in storytelling and journalism and more of a narrative to it than just getting across whatever selling your product and pushing people towards action in the clearest way possible. Demian Farnworth: Right. I think too with content marketing really is about educating and obtaining and forming, but really this is not a hard sell. So we have space to tell stories and not every blog post that we publish needs to be some sort of hard hitting advanced technique. It could be like just what happened in the office today some daily piece like that. But the consumers come back for the content, and so when you think aloud and show your human side of yourself through stories, you can accomplish that. Dan Levy: Any examples come to mind of brands or content marketers that are great storytellers? Demian Farnworth: Great storytellers, well, I think Airbnb – I mean this is a borrowed story it was a ball and chain that they did, but they told a great story. That was a story that’s not necessarily pushing Airbnb; it’s just showing the unique connections that can be made. But again it’s about creating that brand awareness, and my favorite example is this content marketing company that actually sells a product – Red Bull – because they turn out all this content for extreme athletes, and oh by way, they also sell a high energy caffeine drink. Dan Levy: Right. So they do like a job with that stuff. Demian Farnworth: Right, yeah, I mean I’m sure there are people out there that think of them as publishers or a media brand just as much as an energy drink. Dan Levy: Exactly. One trait that I was especially happy to see included in your list for all web writers to have is research skills. I guess you can sum that up as everything that needs to take place before you actually start writing, right? Dan Levy: Data and surveys and actually speaking to experts in your field. Let’s say I’m looking to hire a writer for my team, how can I evaluate whether she or he brings those skills to the table? Demian Farnworth: That’s a good question. I think the best way that I would probably handle that is to say pre-interview or whatever is just tell them: hey listen here’s my hypothesis. Go out and find me the answers to that or go out and find the research for that, and so just to demonstrate whether they can do it or not. Because like you said it is really about preparation. I think too the part that I like about the research is that demystifies in a lot of ways in what we as writers do because people think like “I can never think like that where did he come up with these ideas?” It starts with a hypothesis, right? It starts with an idea, a hunch I have like if I think if X then maybe Y. But then I have to go out there and find the research or find answers or find experts and stuff like that, and then allow that hypothesis to be changed or confirmed by that particular research. And then once you have all that information then you can sit down and write the article because it’s, you’ve probably experienced this before, so much easier if you over-prepared than to sit down and just sort of gush out like what you’re trying to say. Dan Levy: Oh yeah for sure. I feel like this is one of these characteristics that is probably in short of supply out there right now. Demian Farnworth: Yeah. It’s unfortunate because we have this high demand for content, and then really aggressive publishing schedules and so the amount of research you get it might be like three inches deep, but it’s like a thousand miles wide and it’s like okay. That’s one of the things that I really keyed on with Google when they rolled out that in-depth feature for their search that’s because they were saying we want original in-depth research. We want stuff that goes deep, like ten percent of the market kind of wants that stuff so. Dan Levy: And it doesn’t just mean linking to whatever comes up first in the search results. Dan Levy: Like it’s not enough to just link, you have to actually look into those sources and see if they’re credible, and try to also do some original reporting ourselves. Dan Levy: One thing I was surprised to see on your list was average caffeine appreciation as an essential part of the web writer’s anatomy. I can’t tell if that one was tongue and cheek or if you think that caffeine really is essential to the writing process. Demian Farnworth: It is tongue and cheek but I think that it’s essential to the writing process. That was actually our editor she recommended that of course it needs credit. I think there is a stereotype that writers are caffeine consumers, but we could have just as easily put booze on that list. We chose to go with the more PC route. Dan Levy: Fair enough yeah. I think you had a quote in there though that your best ideas come out of booze, but when it comes to actually executing them that’s when you want to turn to caffeine. Demian Farnworth: Yeah. There’s actually research. There was an article I forgot where it was published, but yeah the headline was Write Drunk – well, that’s actually Hemingway, Write Drunk but Edit with Caffeine or something like that. I think that’s how it was because of the idea being that all inhibitions should be out the door when you’re writing the rough draft. But then you should then invite that critic back inside when you sit down and be on point, and I think caffeine in some ways helps some people to be really on point when they’re doing the editing process where you actually make your money. You don’t want drunk people driving heavy machinery. Dan Levy: That’s right. This brings us to the last aspect of the web writer’s anatomy that you zero in on, which is an above average combative work ethic. Dan Levy: What do you mean by combative? That word surprised me. Dan Levy: Plumber’s block is something else I think. Demian Farnworth: Yeah, right. That didn’t come out right. But speakers don’t get talking block or whatever, so there’s this tendency to when you walk to creativity’s door it’s like knock and nobody answers and you kick the damn door in and you make yourself at home and you’ve got the refrigerator and you do everything you can because there’s so many things. I think writing is it feels to me at least in some sense like you can find every excuse not to write. So the other combative part about it is that when you’re dealing with a lot of editing and stuff it’s like there’s the tendency you want to give up, and there’s a lot of self-doubt. So the metaphor really comes from – there’s a scene in the documentary It Might Get Loud with Jack White, it’s Jack White, The Edge, and Jimmy Page, and there’s a scene where Jack White is talking to the younger Jack White. He’s telling the younger Jack White he’s like “you have to fight the guitar”, and then he said “you have to win.” I love that metaphor because it’s like sort of vacant lot advice you give to your little brother, but it’s not just like “you have to fight”. No, you need to come out of this alive, and I think that’s true. I don’t know about you, but writing for me has been one of persistence because it can be lonely and it can be hard. It’s like you have to really just kind of think like militant about what you do, so that’s where the combative comes from. Dan Levy: Yeah. Man I need to see that documentary it sounds cool. Demian Farnworth: It’s a great one. It is really neat. Dan Levy: I guess it also relates back to what you were saying about you should have an opinion and be willing to defend it. Demian Farnworth: Yeah, exactly. And I think that’s hard too like Joan Didion, what they said about her is like she’s this very petite small woman, but when she writes she’s very aggressive and she’s very combative and she’s not afraid, sort of like she becomes a tiger behind her words and stuff like that. I like that and I think for a lot of people like the writers they become alive behind the laptop and actually have a voice. So people get heard when they’re combative – I don’t mean combative in that sense of like you’re a jerk, but you’re willing to say, like Joanna Wiebe said, something of consequence, say something of consequence that makes people pay attention and actually take you serious. Dan Levy: So any last words of advice for someone looking to break into the field of web writing? Demian Farnworth: I read books. I read a lot of books about copywriting. I read a lot of books about writing in general. A great place to start would be Stephen King’s book On Writing. If you’re interested it’s part autobiography, but it’s part of advice and I think it’s been one of those books that really kind of helped me just demystify the act of writing and just realize that it’s a craft and it’s just a discipline just like any other discipline. You just have to dive in and work towards, you know. Like the confidence that I have now I didn’t have 16 years ago, but that’s because I sat down and just started doing the hard work. Dan Levy: For sure. How about any words of advice for companies who are maybe looking to add a writer, maybe a combative writer, maybe an introspective writer who is not used to working in a team, and adding that to the marketing team? Demian Farnworth: So how do they find those people? Dan Levy: How do they find them or any maybe words of advice for working with them. Demian Farnworth: For working with them, yeah, great. I love it when employers, clients like that respect your discipline meaning like they recognize okay the reason I’m hiring you is because of what you do, and I’m fortunate at Copyblogger that Brian’s always been like hey I need a series on this. And that’s all the instruction he gives to me, and I’m turned loose to go do how I see fit. So those are the higher level, top level writers, but then if you have a writer who’s just coming in on their own, they may need more direction, they may need more encouragement, and sort of correction, which I think correction and feedback is always, always so good. But to encourage those people to write, give them direction, and give them feedback on what they’re doing. Dan Levy: That’s really good advice. Like any other team member that you might manage whether there’s someone who likes a lot of autonomy or someone that likes direction. Dan Levy: Very cool. Well, thank you so much for taking the time to chat, Demian, this was great. Demian Farnworth: Thank you so much for having me, Dan, I loved it. Stephanie Saretsky: That was Demian Farnworth, Chief Content Writer at Copyblogger. Be sure to check out his podcast, Rough Draft, in the iTunes store. That’s your call to action, thanks for listening.